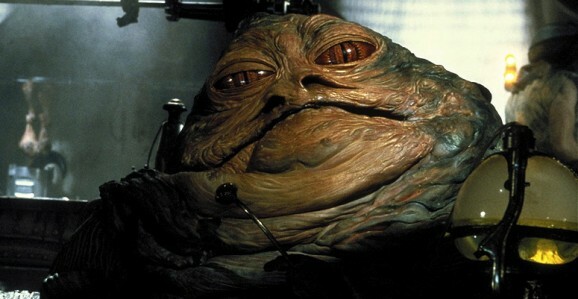 The most famous Hutt of all time, Jabba the, obviously met his end a long time ago in Return of the Jedi. While they’ve been around, none of the fat, slimy bastards have played that key a role in the Star Wars universe since, but according to the latest internet scuttlebutt, we could be seeing them show up again and play an important part sooner rather than later. Be warned, fair readers, there are sure to be some SPOILERS beyond this point. According to Latino Review, who are monsters on the Star Wars news beat, members of the giant, slug-looking species figure into the plot of J.J. Abrams’ upcoming Star Wars: The Force Awakens. And it isn’t just one Hutt, as there will reportedly be at least a few, though exactly how many remains to be seen. It’s not entirely clear how the Hutts factor in, but the report references earlier seen concept art that showed Princess Leia meeting with them. We’ve heard that she is a big time politician and a key figure in the Galactic Republic that emerges after the destruction of the second Death Star, so it makes sense that she might encounter them in an official capacity. It could also somehow involve the fact that the last Hutt she ran into enslaved her and she choked him to death with a chain while wearing a metal bikini. However their presence fits into the story of The Force Awakens, one promising thing is that the report states the Hutts will be at least in large part, practical effects. That’s huge, since we know how questionable full CGI Hutts can look on screen. As with damn near everything Star Wars related, this is all unconfirmed, and even if it is real, we have no idea how it fits in, and likely won’t until The Force Awakens opens on December 18. And that’s how it should be. Are you excited to see more Hutts? I’m more curious than stoked, I think, though their presence could provide an interesting wrinkle to the story.